How An Effective Attendance Management System Contributes To The Overall Growth Of An Organisation? To keep a check on the productivity of all the employees in the organization, one of the important aesthetics is to monitor the attendance of the staff of the enterprise in the corporate world. While it would be no wrong to say that employees and staff of the organization contribute to the profits and productivity of the company, at the same it is highly crucial for the staff and employees to be physically present in the organization to earn their salaries. In earlier times, almost each of the organization used to rely on the traditional ways of registering the employee’s attendance, such as by maintaining a monthly register. However, maintaining and registering manual attendance had a lot of drawbacks and its disadvantages. And to combat these errors and incorrect attendance entries is by installing biometric attendance management system which is error free and at the same time allows saving time. At Eilisys, we provide the most efficient and error-free attendance management system in Pune and other parts of the country. How does an attendance management system work & what is the process involved? In most of the big companies of the corporate house and world, usually, the organizations install a biometric system for registering attendance that coherently works with the help of an issued card. While following this method, each employee is given a specific and unique card that has its particular barcode. The attendance is registered when the employee swipes off the card on the attendance machine and then the attendance is marked. While some of the companies follow the method of taking the fingerprint or the thumb impression of the employee to register and manage the employee management software. 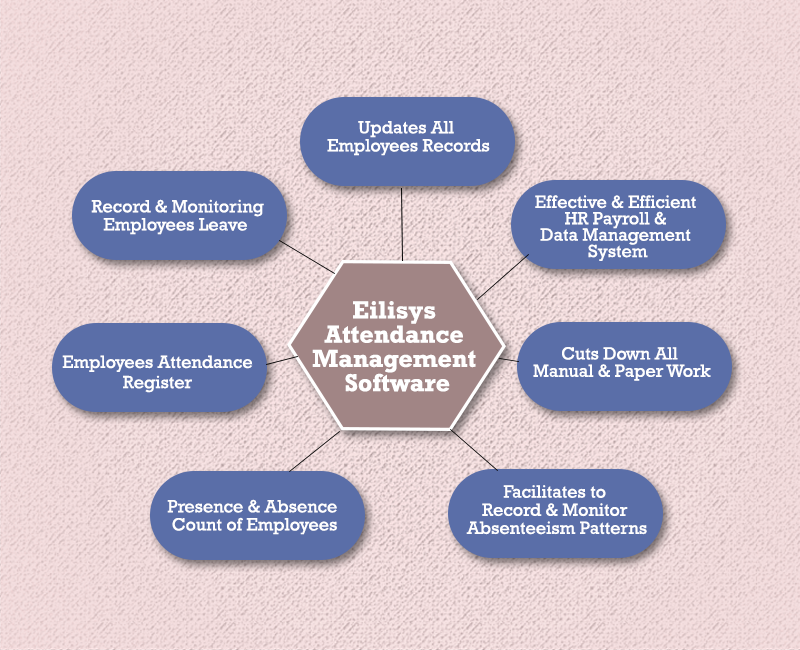 How your organization will be benefitted by employing Eilisys Attendance Management Software? With the help of an effective attendance management system, you can now easily monitor and watch over the presence and absence of all the staff and employees of your organization. It further facilitates to record and monitors the absenteeism patterns, leaves, and in effect in the productivity of the employees. A good attendance management system will also help to make the HR payroll and data management system all effective and efficient. With the help of biometric system installed in your organization, it will aid and assist the HR management to keep a check by collecting all the leave records of all the staff and employees HR payroll in the enterprise. It makes the process of monitoring the leaves and payroll of the staff hassle free. Also, the biometric system uses the latest of technology updates, it allows no scope for errors and misleading attendance entries in the attendance management system. It further facilitates to avoid any manipulation and error done by the employees, which was a common phenomenon that used to occur while using the traditional methods of registering the attendance. The most important and relevant benefit that comes along with the installation of the biometric attendance system is that it cuts down all the manual and paperwork involved. So, with these many benefits and advantages of attendance management software, it is best in your organization’s interest to get this installed in your company.